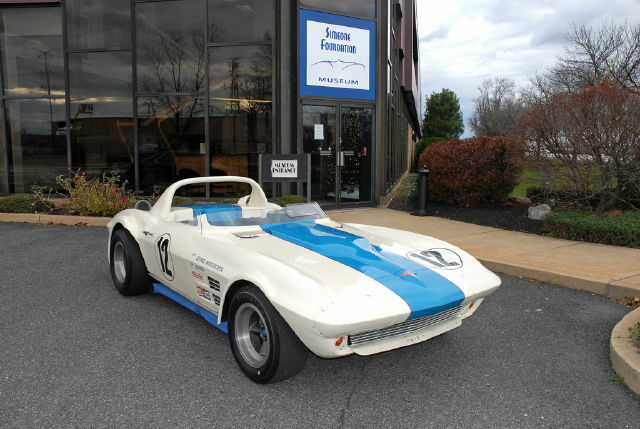 A Grand Sport Corvette – one of only five ever built by General Motors – is the latest addition to the Simeone Foundation Automotive Museum, located in Philadelphia, Pennsylvania. The Grand Sport joins the collection of over 60 of the most significant sports racing cars ever built. The Grand Sport was developed in 1963 by Chevrolet engineer Zora Arkus-Duntov, considered to be the “father of the Corvette,” as a weapon to battle the Ford Cobra. Ferociously fast, the Grand Sport was modeled on the new Stingray, but featured a lightweight fiberglass body, tubular frame and all-aluminum engine. General Motors had a corporate ban on racing at the time and when the top brass heard about the project, it was terminated. But, rather than being destroyed, all five of the Grand Sports built to that point (125 were planned) were sold to private owners to continue the fight against Ford. However, without a development program to iron out the problems, the Grand Sports were unable to reach their potential. The Grand Sport in the Simeone collection is serial number 002 and started life with a coupe body. At some point the top was cut off and the car was made into a roadster, one of only two Grand Sports to have this modification. Both roadsters were originally purchased from General Motors by Roger Penske, at that time a Philadelphia Chevrolet dealer and just beginning his legendary career as racing team owner. The 002 chassis was modified by Penske to fit a monstrous 427 cubic-inch aluminum engine and sold to George Wintersteen of Villinova, Pa. Wintersteen campaigned the car in several events of the 1966 United States Road Racing Championshp. But by that time the car was hopelessly outclassed. One interesting aspect of the acquisition of the 002 Grand Sport is that it came with a complete, duplicate body and a second engine. The replica body was commissioned by the former owner and mounted on the original chassis frame so that the car could be used in vintage races without damaging the original body and engine. As a result, this Grand Sport is considered the most original of the five. Chassis 002 was last seen by the public at RM Auctions’ Automobiles of Arizona sale held January 16th, 2009 where it did not sell at a high bid of $4,900,000.